(Nanowerk Spotlight) Research on micro- and nanomachines has advanced from the observation and understanding of basic motion behavior to the constantly improving capabilities of performing complex tasks. This ranges from interaction with bacteria to propulsion based on cells and in vivo medical applications. Drawing inspiration from the sophisticated biological machines in nature, researchers have been attempting to bridge our macroscopic world and the microscopic one by building controllable micro- and nanomachines. These synthetic systems are envisioned to move, sense, and implement specific functions like their biological counterparts. While the micro- and nanomachines that scientists can build today are still primitive to be applied in real life, the long-term value of the study has attracted the attention of the Nobel committee. The Nobel Prize in Chemistry 2016 was awarded jointly to Jean-Pierre Sauvage, Sir J. Fraser Stoddart and Bernard L. Feringa for the design and synthesis of molecular-sized machinery. 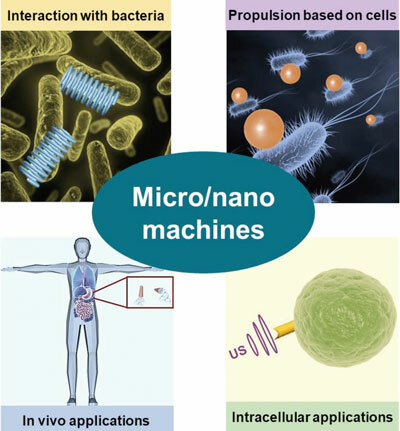 A recent review in Advanced Functional Materials ("Micro/Nanomachines and Living Biosystems: From Simple Interactions to Microcyborgs") looks at the applications of micro- and nanomachines in living biosystems from two aspects: the interaction of micro/nanomachines with other microscopic organisms or biological units, and the efforts toward application of micro/nanomachines in human body. As illustrated in the figure below, the first aspect is subdivided into the interaction with bacteria and biohybrid systems harnessing biological cells, while the second aspect discusses the efforts made toward in vivo and intracellular applications of micro/nanomachines. Researchers have developed various strategies based on micro/nanomachines to detect, isolate, and kill bacteria. The development of innovative solutions to treat bacterial diseases is driven by the urgent demand to change the way we use antibiotics. Nature provides a myriad of sophisticated biological cells that can display and regulate motion in well-established manners over long ages of evolution. Biohybrid systems integrate these biological cells with synthetic materials, enabling their corporation to make a bigger difference than that by working alone. The cells used as building blocks include motile cells with direct swimming ability (e.g., bacteria and spermatozoa), contractile cells able to generate a directional tension (e.g., cardiac and skeletal muscle cells), and immune cells bearing intrinsic chemotaxis ability (e.g., white blood cells). Toward realization of the scene in the Hollywood film Fantastic Voyage, extraordinary nanotechnology efforts have been devoted to push micro/nanomachines towards their practical use in in vivo applications. However, this concept poses many challenges to its practical operation. As a tetherless device, the in vivo navigation of micro/nanomachines requires either self-propulsion using biocompatible fuels or propulsion by other noninvasive energy. Due to the foreign nature of the synthetic micro/nanomachines, the risk of being destroyed by the immune system and the postprocessing after implementing tasks are crucial problems that cannot be neglected. With traditional medical technology, it is difficult to perform operations at cellular level. The ultrasmall dimensions and tetherless design enable the micro/nanomachines to interfere cellular processes. Examples of currently available cellular tasks include intracellular sensing of endogenous targets, genetic intervention, controlled delivery and release of desired compounds such as drug, enzyme, cytokine, and so on. "Despite the tremendous progress obtained in recent years, the micro/nanomachines are far from mature in both theory and applications," the authors conclude their review. "To push forward in-depth applications of micro/nanomachines in biosystems, improvement is still needed in many aspects."